We are super-proud to welcome Vintage® to our portfolio of distributed brands. 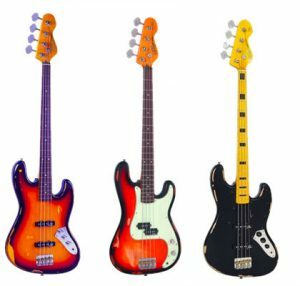 Because during our many years in this industry we have never seen such a perfect balance between quality, design, playability, tone and price than these guitars and basses. No, seriously! It’s hard to believe that the ICON series in the above picture are sub-€400 instruments, and when you have played one first-hand it’s an even more jaw-dropping experience. But let’s rewind for a second. What is the story behind the Vintage brand? Well, it actually originates from England and was founded by industry-veteran John Skewes back in the mid-60s when he formed a small musical instrument agency and wholesale business based at his home near Leeds. Over time, his new business steadily began to take off, and soon included throughput of some self-branded lines of musical merchandise. That effective early decision to carry self-branded products continues to this day. And the Vintage acoustic and electric guitars and basses adventure began in 1985. Today, Skewes is the largest family-owned independent musical merchandise distributor in the UK and the Vintage ‘family’ also comprises Laka® Ukuleles, which we have also added to our portfolio. 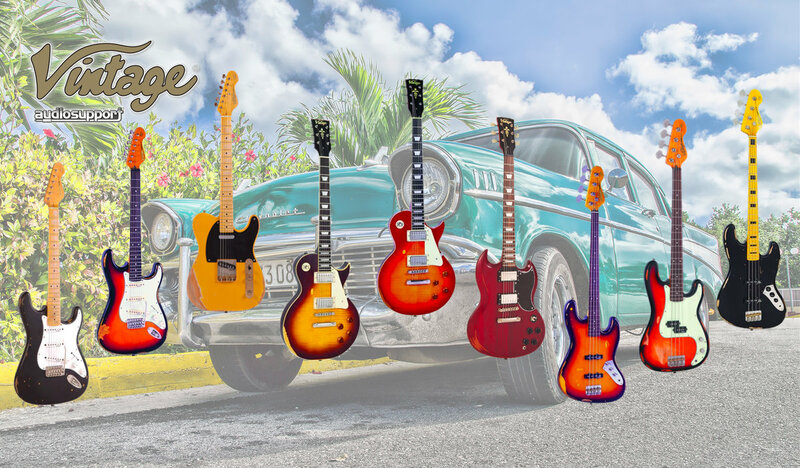 The central idea behind Vintage is to offer accessibly priced, vintage-looking guitars with great finishes, quality parts, and features that are typically found on guitars costing many times more. 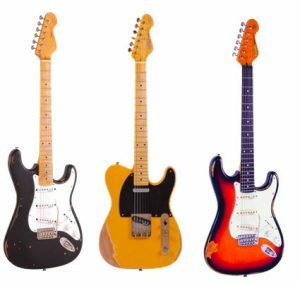 So, to design an industry-leading line of professional but affordable guitars, the legendary designer Trev Wilkinson joined forces with John Skewes over a decade ago. And one of the consequences of this collaboration is class-leading Wilkinson®-designed hardware. 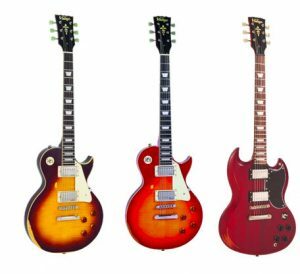 Certain features make Vintage guitars a ‘bigger bang for the buck.’ Subtle changes to traditional guitar designs have been made so they perform much better. For instance, on the spring block, the holes are staggered in a way that allows the strings to leave the block and pass over the saddles at a consistent angle that helps keep those strings in tune. Trev also developed tuning keys called EZ-LOK™ that work like a locking tuner, but actually don’t require any mechanical manufacturing. There’s nothing to unwind when you’re slacking the strings using the vibrato, and they always come back to pitch. The same goes for the pickups. Trev doesn’t have a high-dollar pickup range to protect, so he can produce pickups that will sound as good as any company can wind anywhere in the world. Trev has been described as ‘Britain’s one-man think tank’. Asserting that there’s always more work to be done when it comes to improving guitar playability!